Seasoned, uncured pork baked in pastry. You don't just become Britain's favourite branded pork pie* overnight. At Pork Farms we've been baking for over 80 years. It's how we've mastered getting our pork pies to taste so good. So moreishly meaty. Our secret? Seasoned British pork, wrapped in our crisp, flavoursome pastry. And that's it. The magic is in the simplicity. *Based on Value Sales. Source of AC Nielson. Simply remove all packaging and place on a baking tray in the middle of a pre-heated oven at 180°C/160°C fan/Gas Mark 4 for 15 minutes. Stand for 2 minutes before eating. Marvellous. Produced using Pork from the U.K. Remove from the fridge 15 minutes before serving for the best flavour. We've been making great pies and savouries for over 80 years and are proud of our products. We want to ensure you are pleased with your purchase. 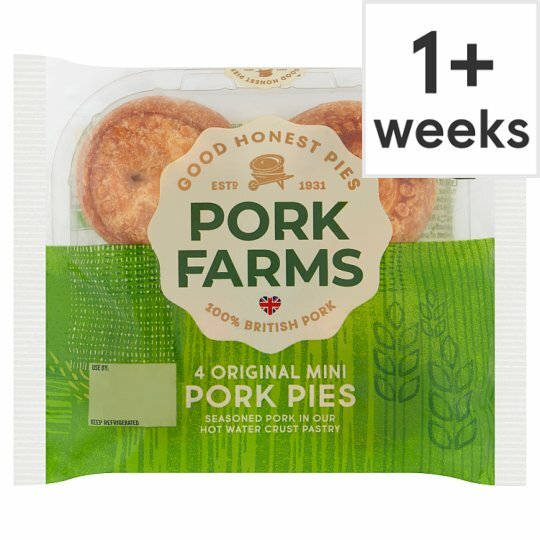 If these pork pies fall short of expectations, please let us know; informing us of where and when you bought them, and quote NG016 and Use By Date. This will not affect your statutory rights.